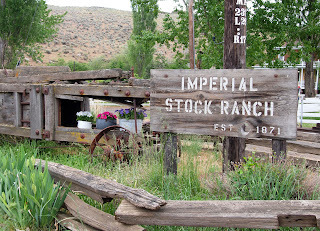 When Jaime and I planned our trip to Portland for Quilt Market, we knew we had to set aside a day to visit one of our favorite yarn producers, Imperial Stock Ranch, in Shaniko, Oregon. 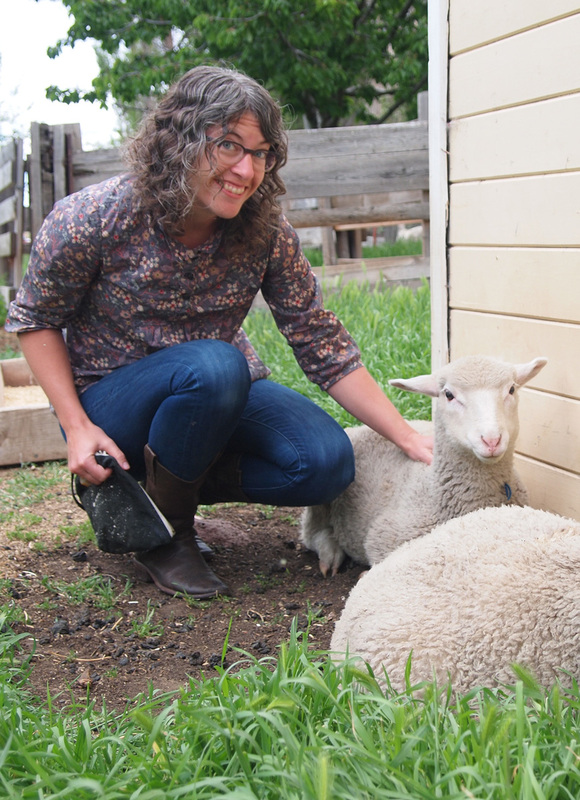 Jeanne Carver of Imperial Stock Ranch was there to greet us with her herd of adorable Columbia Sheep, including some sweet lambs. Jeanne with Charlotte Rose, one cuddly lamb-ster. 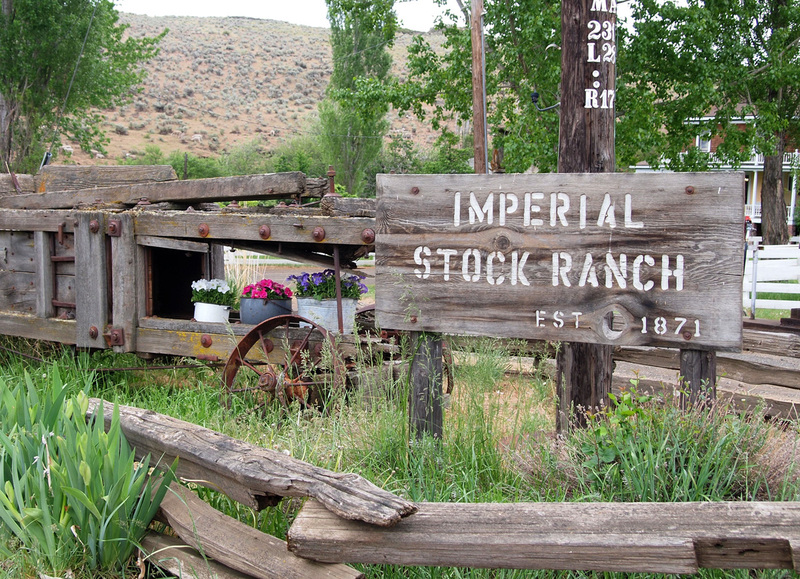 Imperial Stock Ranch was founded in 1871 which means they recently had their 150 year anniversary! Jeanne was kind enough to spend the day with us and share the history and intent of this unique ranch. The only Oregon working ranch on the National Register of Historic Places, this family owned ranch has a focus on sustainability and mindful land stewardship. It was breathtaking to see and hear the stories of this magical place. 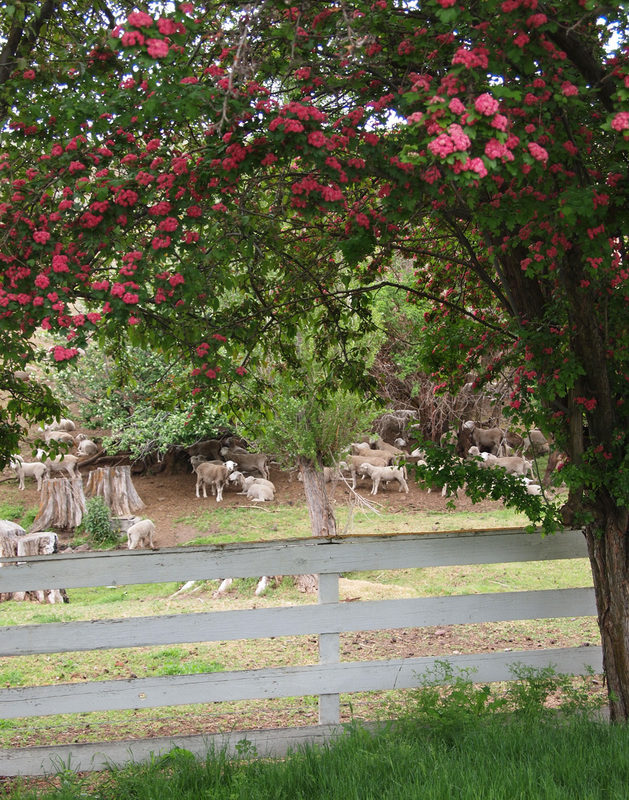 The ranch was founded by Richard Hinton and is where he began developing the cross-breed that would become the Columbia breed of sheep. 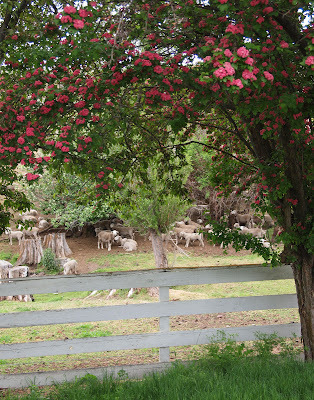 The ranch is dotted with poplar groves and fruit orchards planted by the first ranchers. 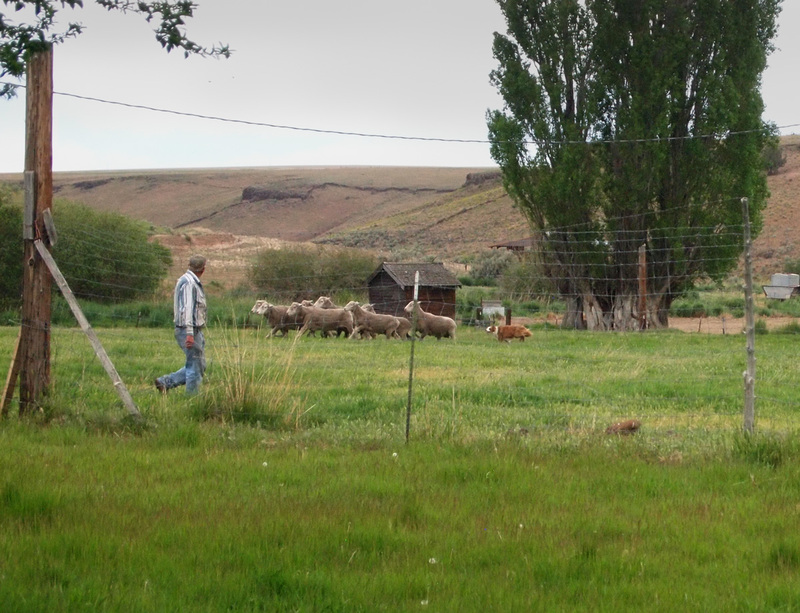 Today the 50 square mile ranch is home to 300 Columbia Sheep and 800 cattle, as well as 500 wild elk. The Carver family shared their love and respect for the land they live on and the animals there. 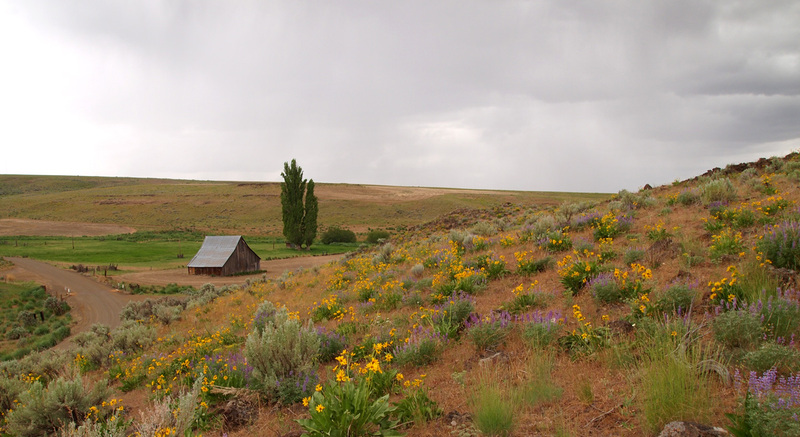 Since they became stewards of the land in the late 80s, they have been working towards more sustainable and healthier ranching practices to improve the surrounding environment. Dan Carver shared with us his experience of seeing the health of their land reflected in the native fish. 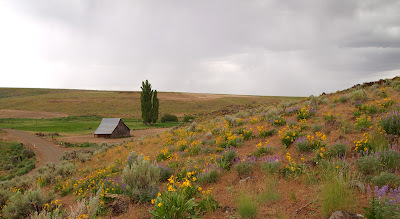 In the decades they have been working the ranch, and by working together with other local ranchers, they have seen the yearly count of salmon in the rivers go from what you can count on one hand to, in years recently, over 800 salmon. 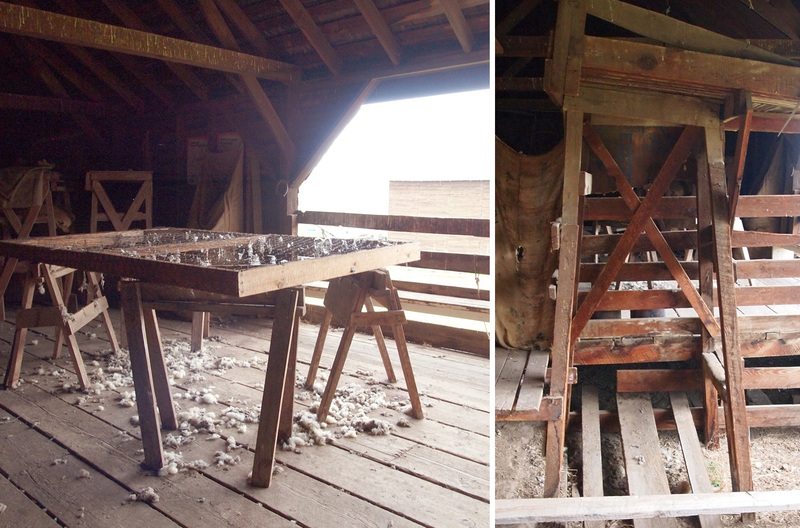 Inside one of the historic barns is where spring shearing happens. Jeanne took us on a tour of their shearing barn, which works the same way as it did in the early days, except for the added convenience of electric shears. Each sheep is sheared and--one fleece at a time--the fleece is skirted. It is thrown whole onto the skirting table, where dirty bits and locks that are too small will fall through the wire mesh table. Someone will give it a look and remove more of the dirty and short pieces that aren't fit to go to the mill and become yarn. Then the fleece is handed off to someone who will bag it. 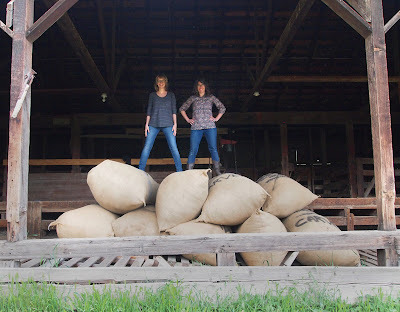 The wooden chute is about 10 feet tall and holds a giant bag open. 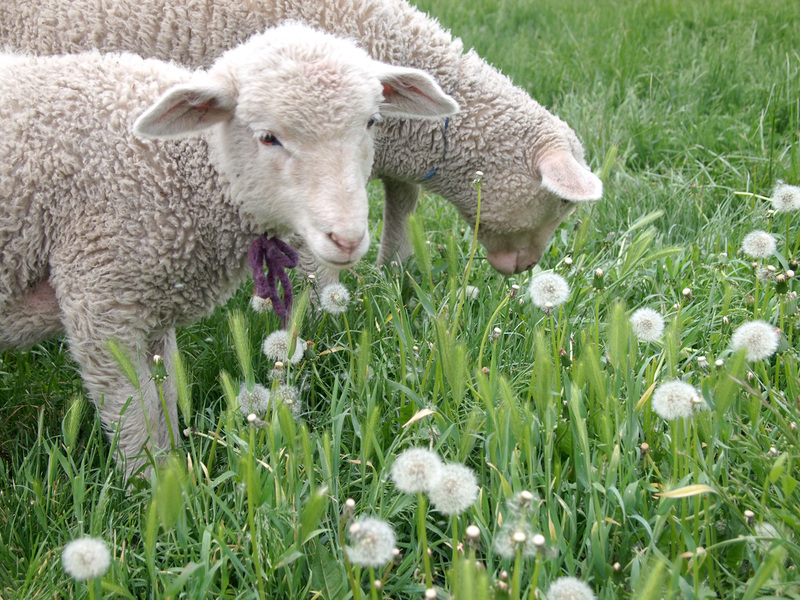 Once a few fleeces are in the bag, a person will climb into the bag and step on the wool to pack it into the bag. The fleeces continue to be added until the person inside stomps enough fleeces to fill the bag and climb out. That sounds like an awesome/greasy job! I bet all that lanolin makes for some really nice skin. Each of these giant bags holds about 300lbs of wool. That means we are standing on 1.35 tons of wool. Sweet. 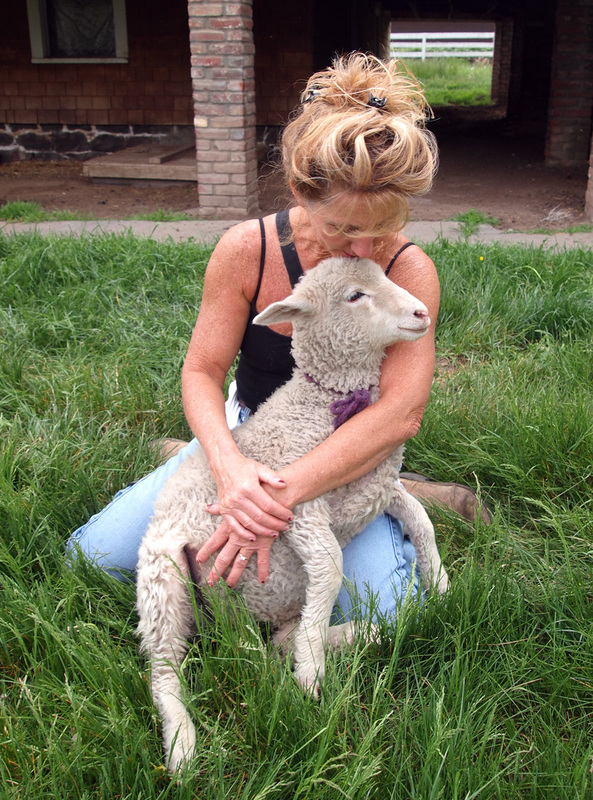 Each year Jeanne is a foster mom to several lambs--those who are born to ewes that can't care for them or have one too many babies. 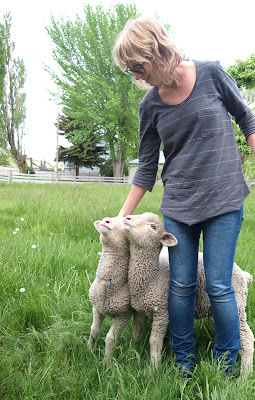 These well-socialized lambs followed us around like puppies and were more than happy to let us play with them. What else would young Charlotte Rose wear around her neck but an Imperial Stock Yarn bow? Can we please take these babies home? 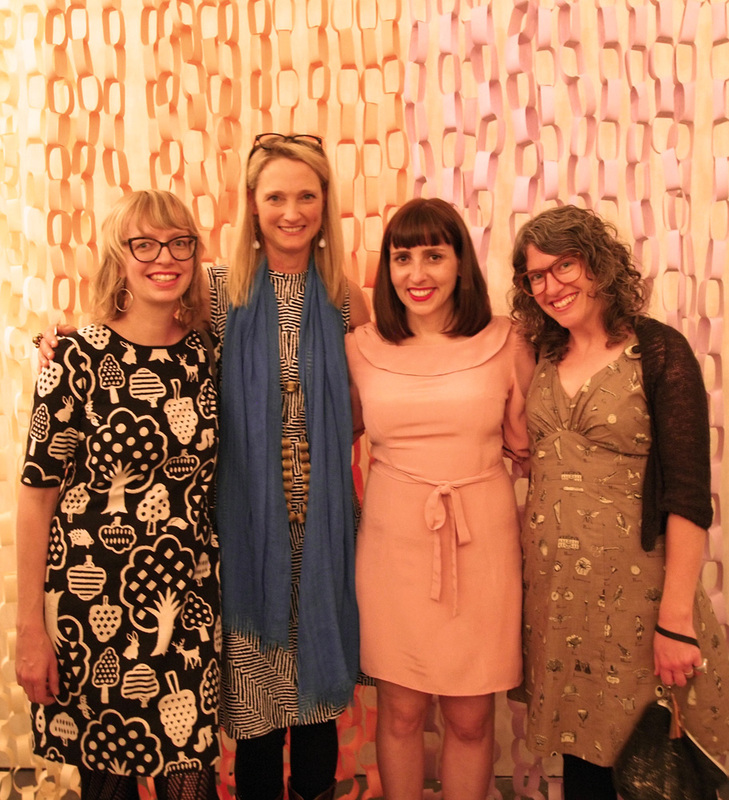 Thanks to Jeanne, Dan, Keelia, Scott, Leah, Blaine and everyone at Imperial Stock for sharing your story with us, and for making fantastic American yarns! While Amber and I were in town for Quilt Market we were able to go to a couple of awesome parties held for Quilt Market attendees! 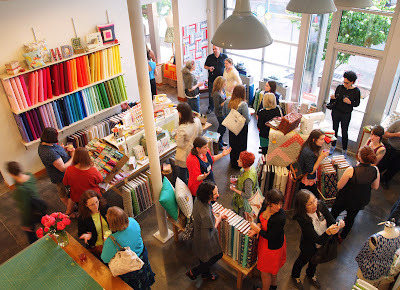 The first one was held at Modern Domestic, a sewing studio in Portland. 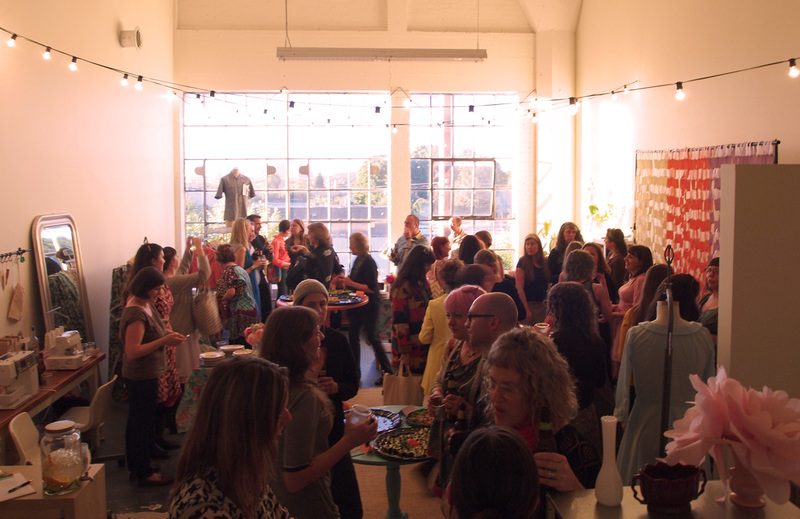 Modern Domestic had just expanded and their new larger space was beautiful and inspiring! 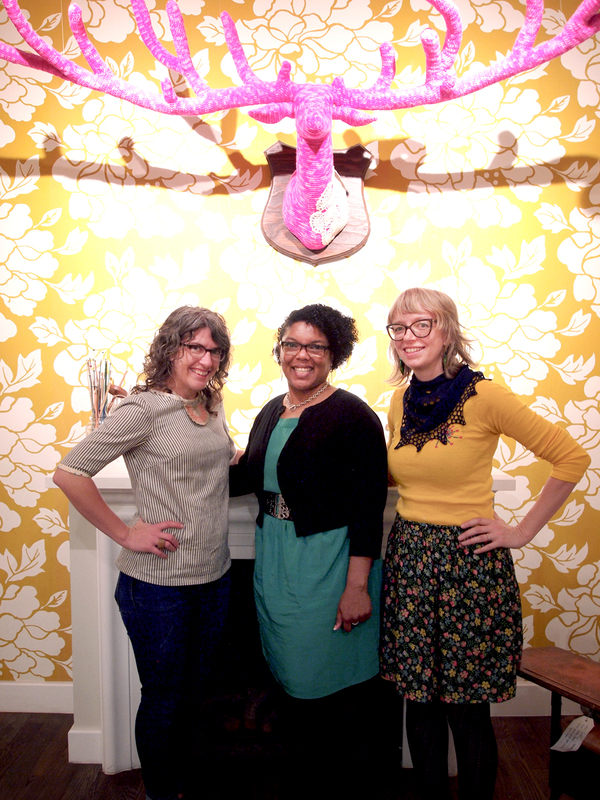 Amber and I loved being able to chat with owners Lupine and Michelle about their shop and experiences. 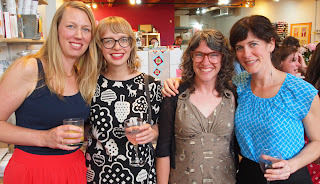 Sarai of Colette patterns lives and works in Portland and hosted a party at her studio for Quilt Market attendees with Amy Butler. Sarai's studio is in the renovated Ford Building--originally built as an assembly plant for the Ford Model-T, and now a home to creative offices and studios. There were beautiful old windows that let in tons of natural light. 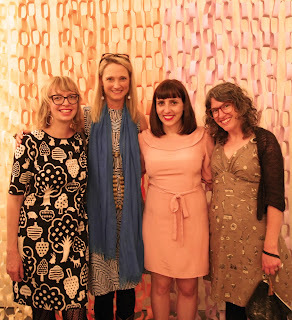 Amy Butler had her garment fabrics on display and there were sewn samples of all of the Colette patterns. 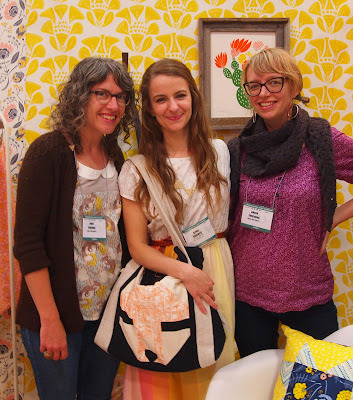 We had a lovely time with Sarai, Amy and lots of other shop owners, fabric designers and pattern makers! Thanks Portland ladies for showing us a great time! Tula Pink has done it again! 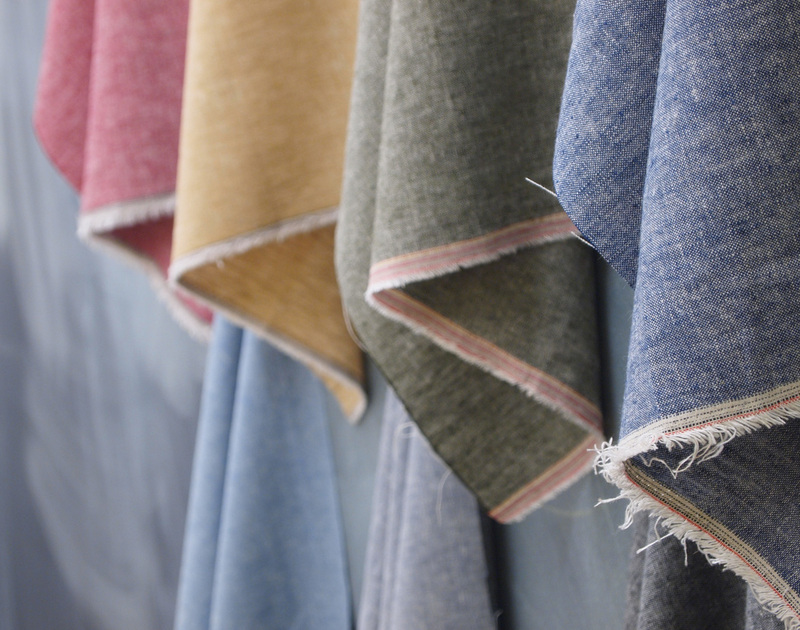 Another stunning collection, Acadia is due this September. Acadia features bright teals, purples, pinks and greens as well as raccoons! We loved her booth floor which echoed some of her print designs. 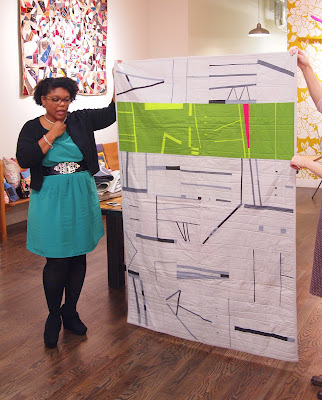 She had tons of quilts on display to inspire us including the one from her new book, City Sampler: 100 Modern Quilt Blocks. 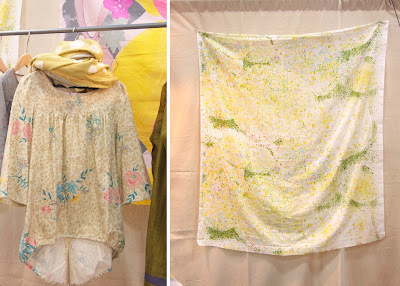 Melody Miller was debuting her new line for Kokka which features 3 of our favorite things: linen, sparkles, and arrows. There will be dresses made out of this the second we get it in, I promise. 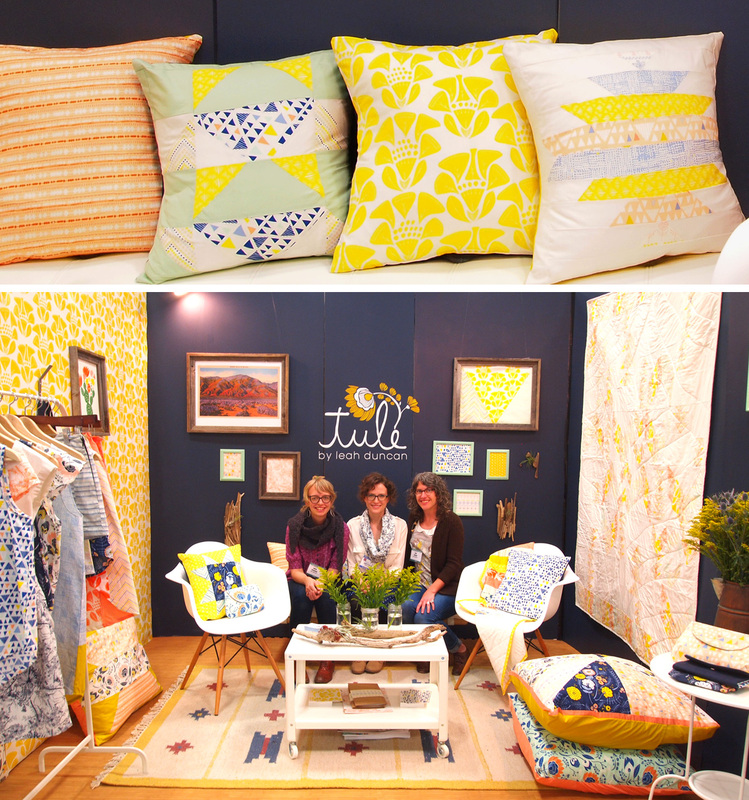 We love Leah Duncan's line Tule for Art Gallery Fabrics. Leah was super sweet and we basically moved into her booth and just hung out there among her pillows and driftwood for three days. We ordered the full line and will be making everything out of it come August. Heather Ross is back! Heather Ross has a new line coming out with Windham which means domestically priced quilting cottons! 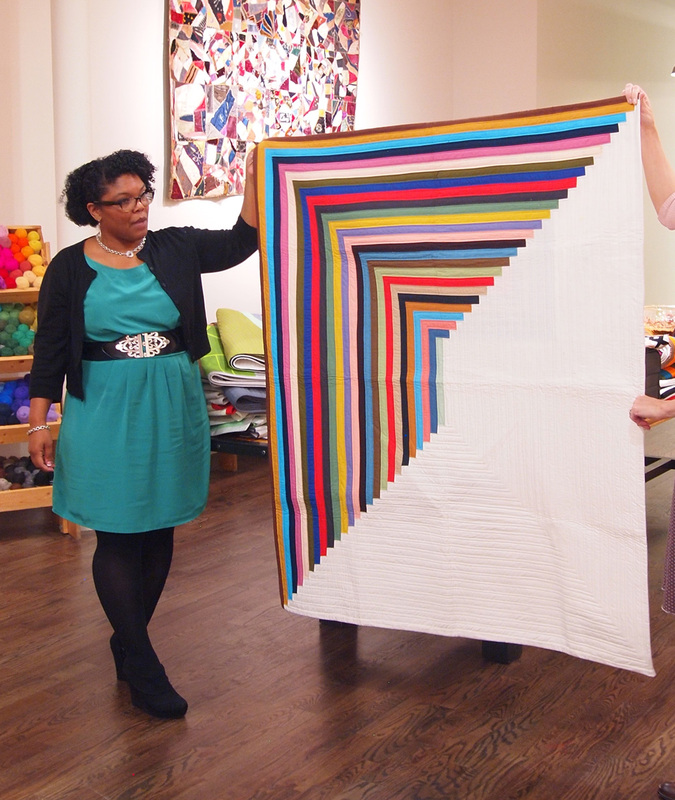 Briar Rose is everything we could have hoped for a new Heather Ross collection and we absolutely love this rainbow quilt by Made by Rae. 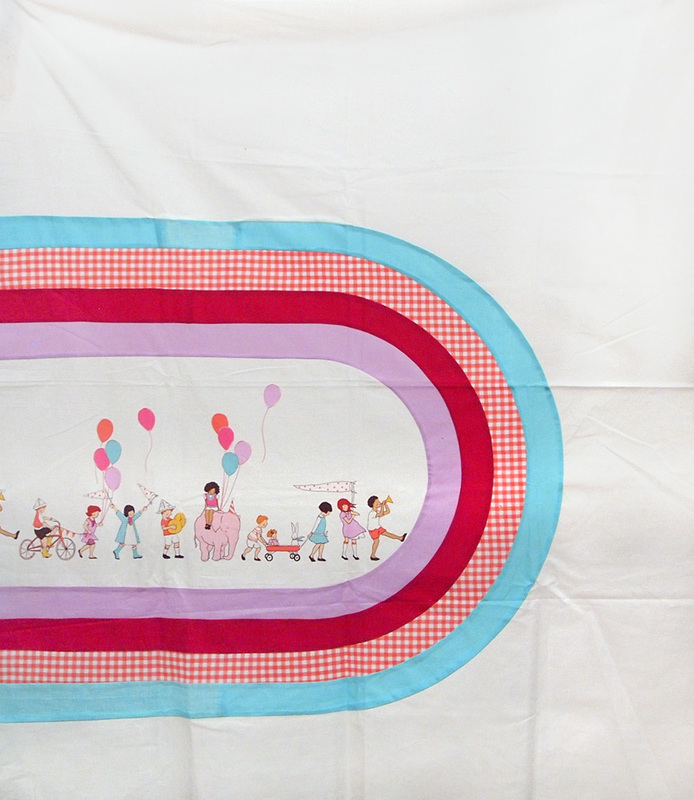 We can't wait to work with these bright, nostalgic prints come July. 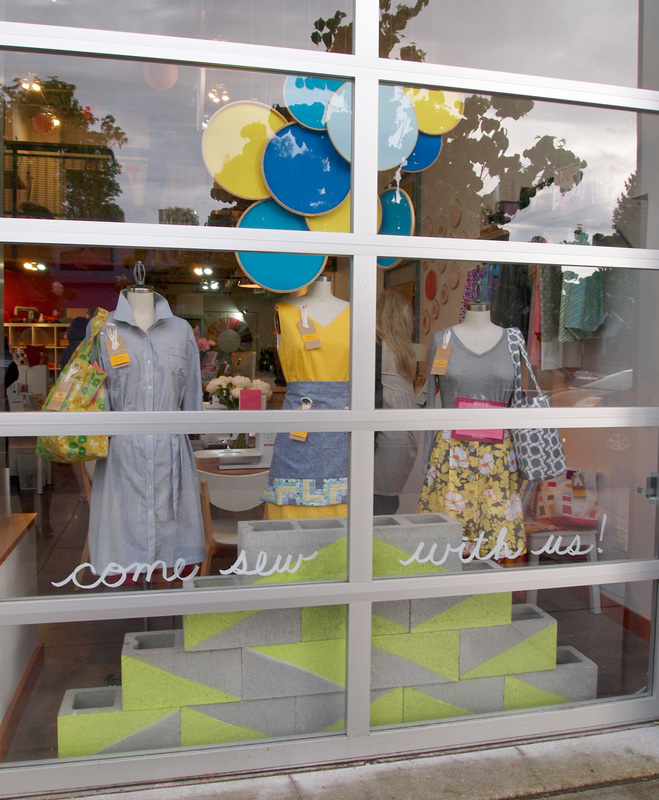 Nani Iro gets us every time. 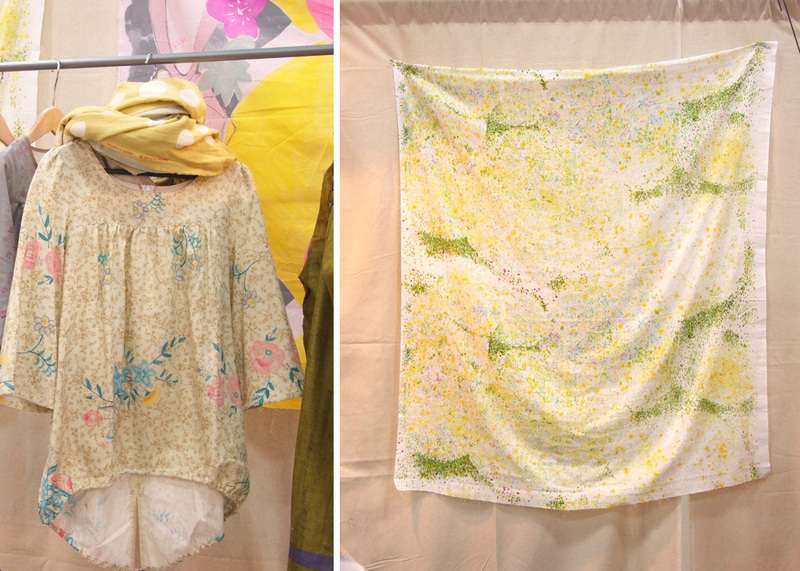 We just can't resist her beautiful, dreamy, ethereal prints. The double gauze and thin linen canvas fabric bases don't hurt either. 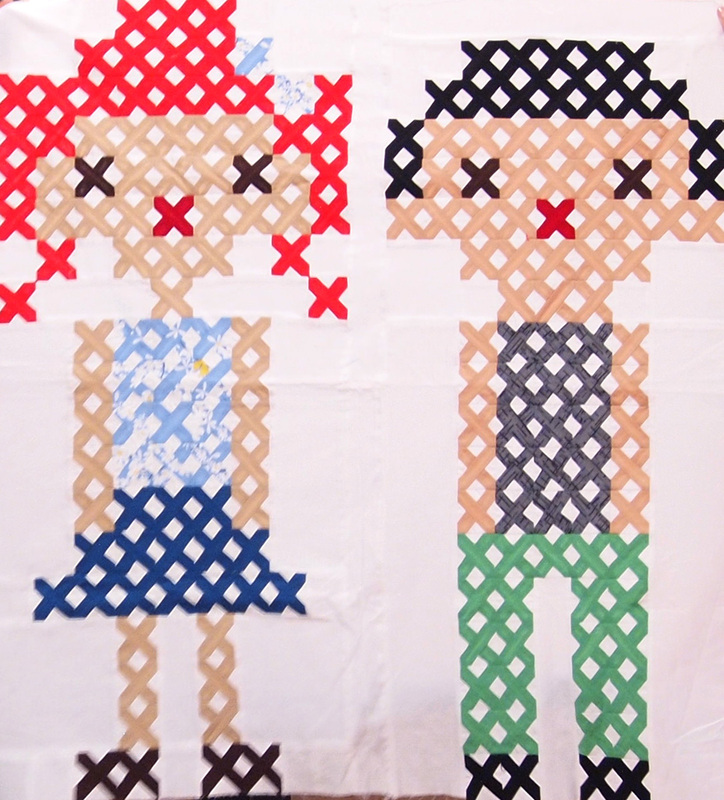 We ordered about a billion prints from her new line so we will be making room for these in late July. Ellen Luckett Baker has another modern line for Kokka called Folk Modern. I'm obsessed with horses so this print may be my most anticipated print from market. SO GOOD! 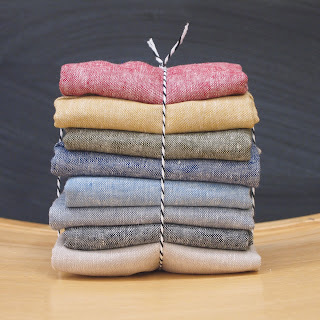 I know this is the news you are all waiting for: yes, we ordered Pendleton wool fabric. Lots of it. It will be here in mid-August and of course, we will throw a little party to welcome it to our shelves. 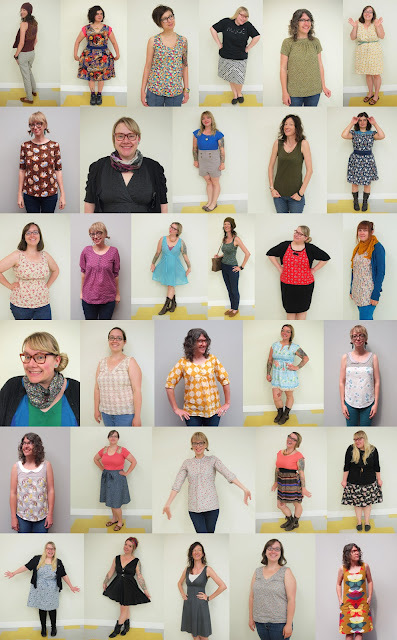 US made delicious wool goodness for all of your fall sewing needs. Dresses, skirts, pillows, bags, will now all be made in wool. Get ready. There were a million exciting things and we ordered so many of them! 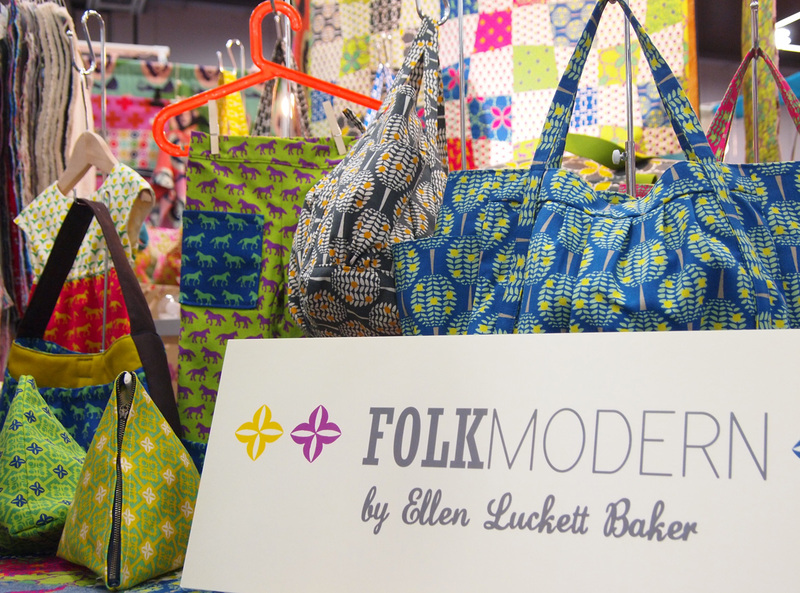 Stay tuned to see when these beauties arrive at the shop and to see what we will be sewing with them. New Miniature Rhino Cross Stitch and Embroidery Kits! Jessica Marquez is the author of Stitched Gifts and the woman behind the company Miniature Rhino. We are thrilled to welcome her amazing embroidery kits to our line up of inspiring craft supplies! My personal favorite are her zodiac sign kits. 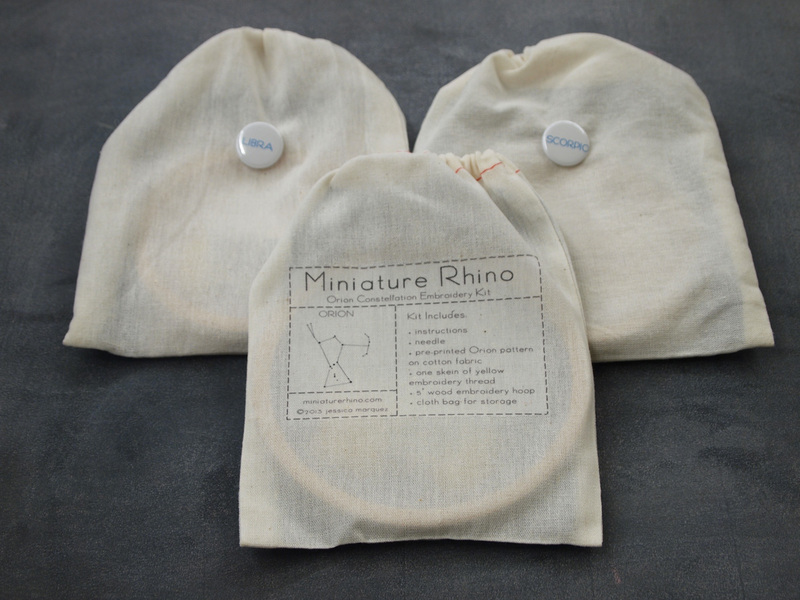 Each adorably packaged kit contains all you need to stitch up your star sign on blue fabric. Amber already stitched up her sign of Taurus (above) and it looks perfect! 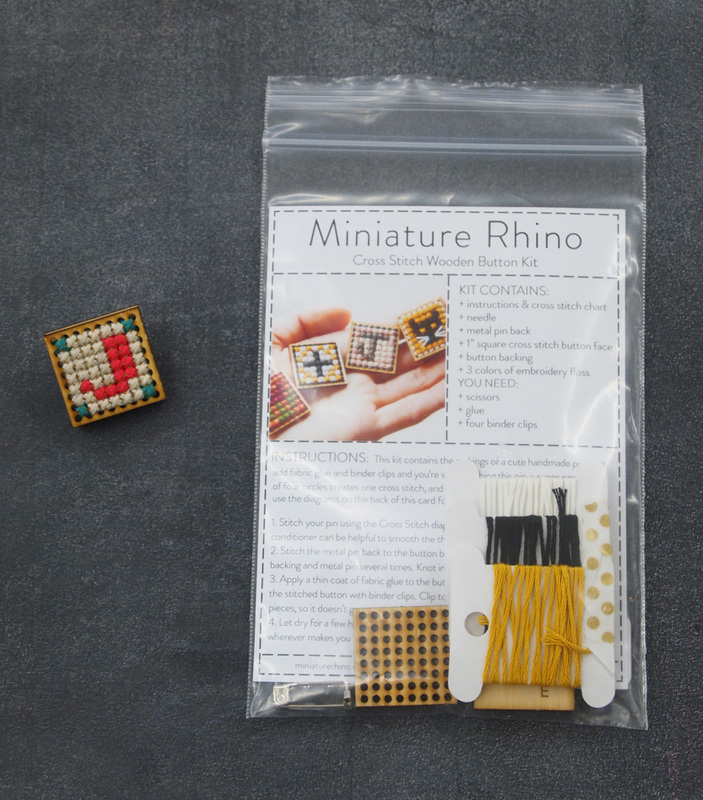 We also stock these Miniature Rhino kits for an alphabet sampler and arrows. These make great gifts and are quick to stitch up. 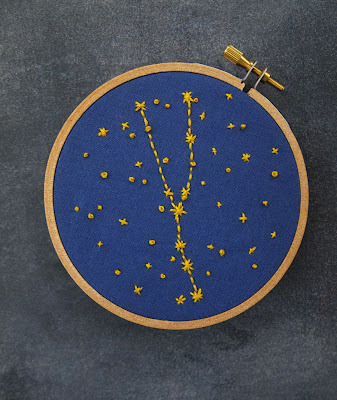 The wooden embroidery hoop also makes a great frame for instant wall art. 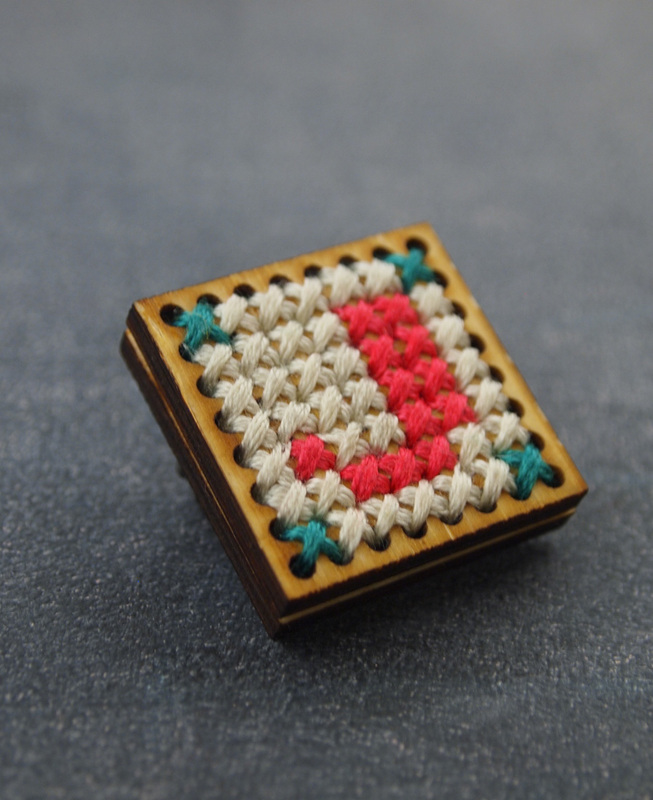 If you want to add a bit of handcrafted bling to your wardrobe, you should probably pick up a cross stitch pin kit. 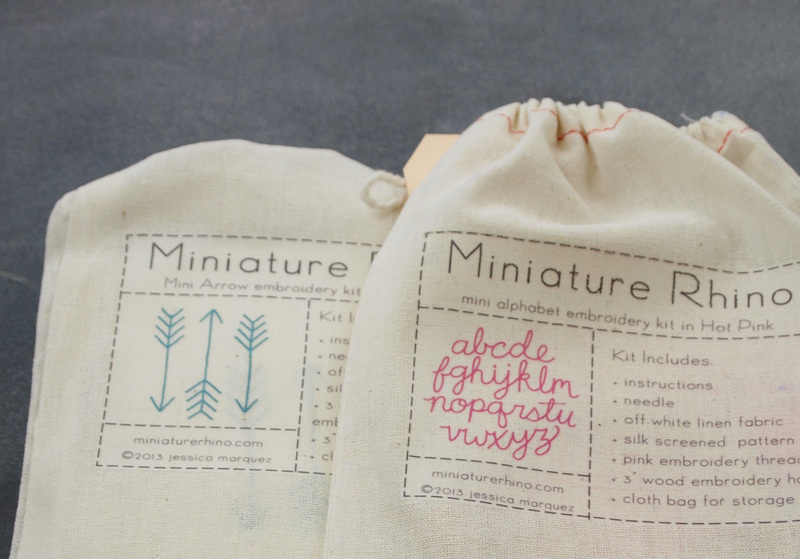 These kits include thread and instructions for stitching every letter of the alphabet as well as several other designs onto a wooden pin. Jessica was kind enough to stitch up a "J" for me and i love it! Thanks, Jessica! 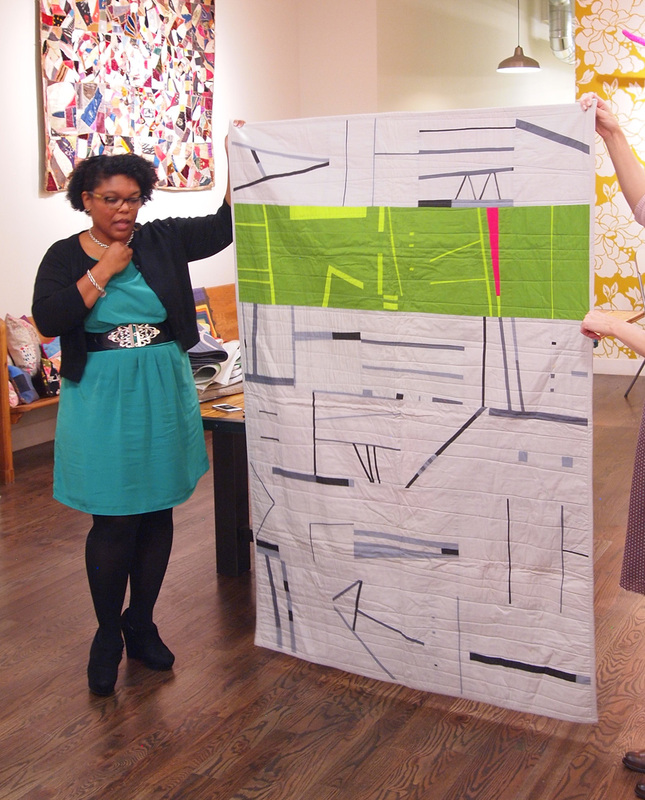 Last week we hosted modern quilter, Latifah Saafir for the Front Range Modern Quilt Guild. 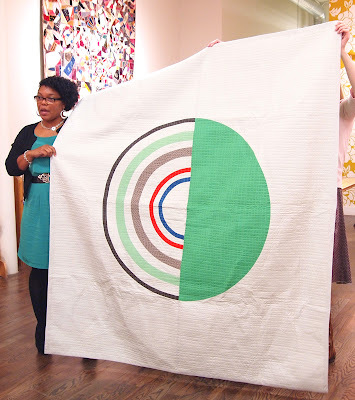 Latifah is a founding member of the Modern Quilt Guild, and an inspiring and accomplished quilter. 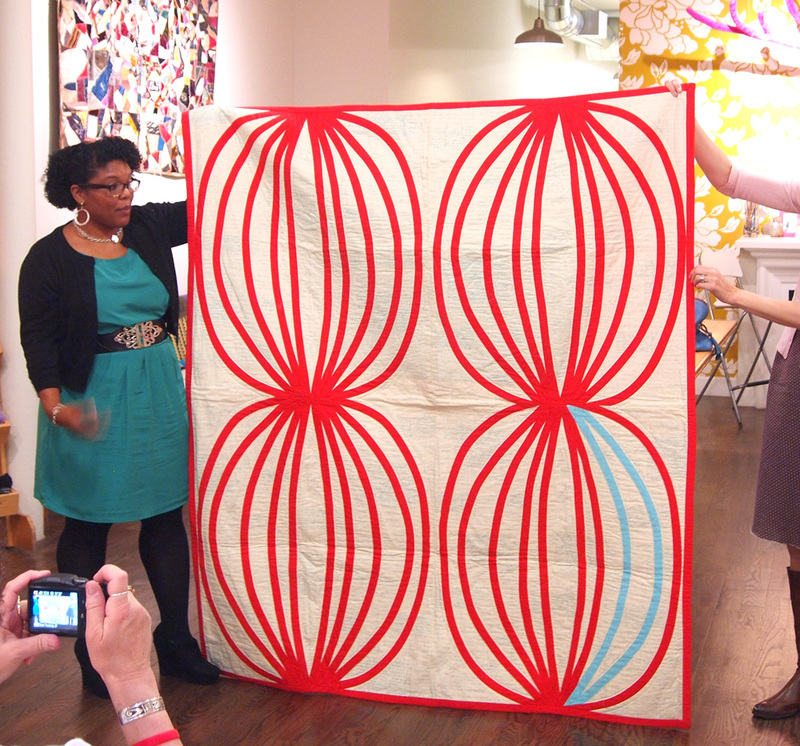 She lectured on "Being True to your Inner Artist" and brought a suitcase full of her quilts to show us. It was amazing. 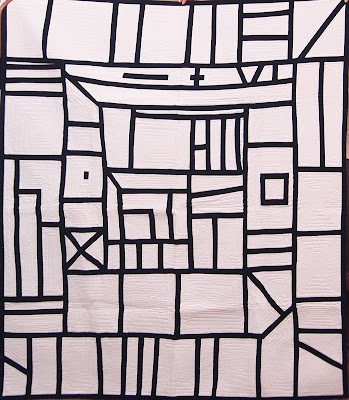 We are blown away by her unique quilting style and love her bold, graphic designs. Latifah is fond of using bias tape to create curved patterns. 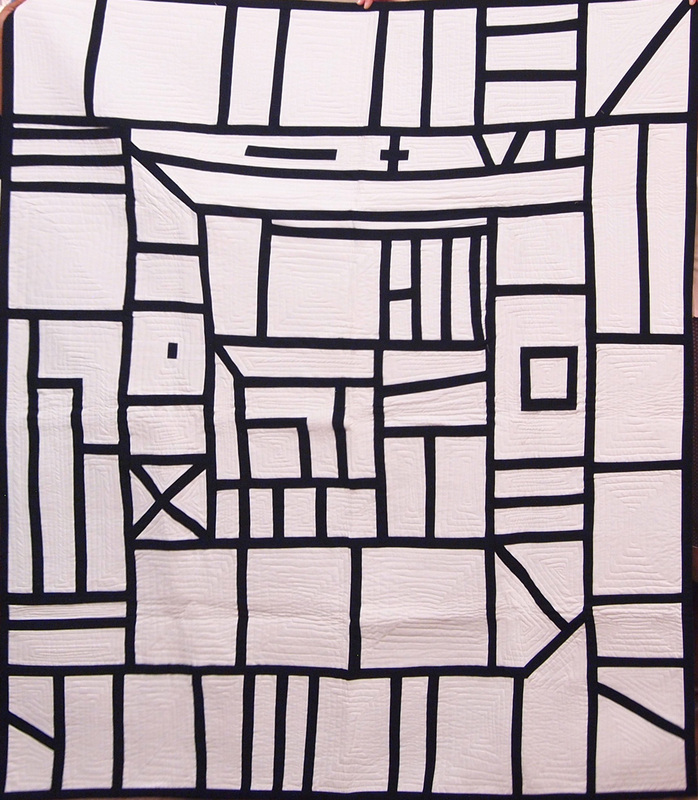 Her attention to detail is impeccable and these quilts were all impressive both in technique and style. Latifah gave us a lot to think about in terms of finding inspiration, process and her own journey to becoming a quilter. 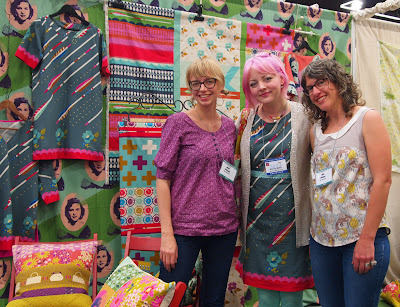 We left feeling so excited about quilting and the modern quilt movement. 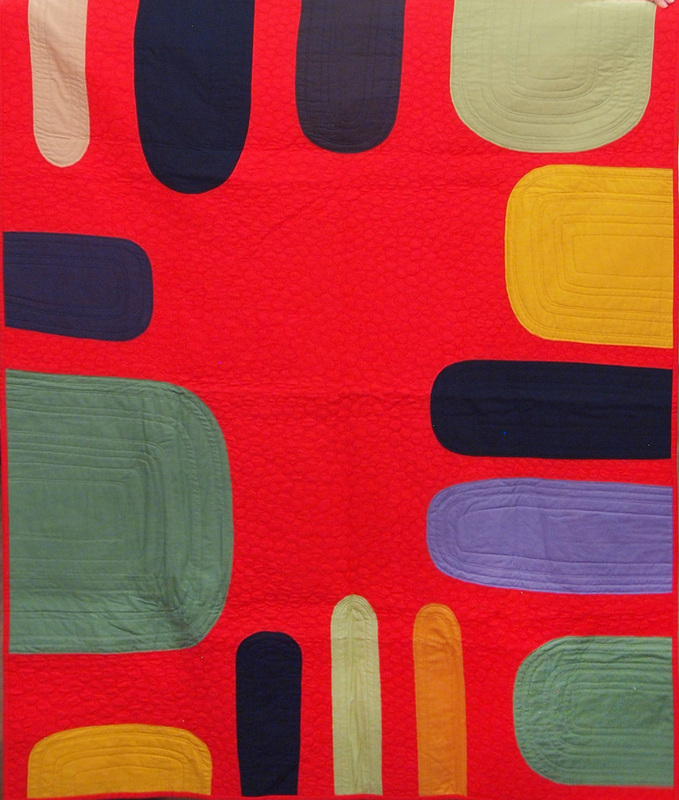 We hope these photos of Latifah's quilts are as inspiring to you as they were to us! 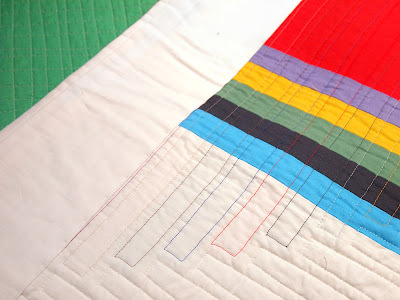 Detail of back of "Stairway to Heaven"
Thanks Latifah and the Front Range Modern Quilt Guild! We are so inspired to make some quilts and hope you are too! 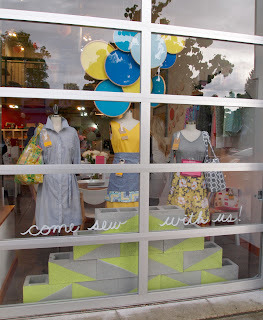 We are already sewing up a storm with these hot new fabrics. 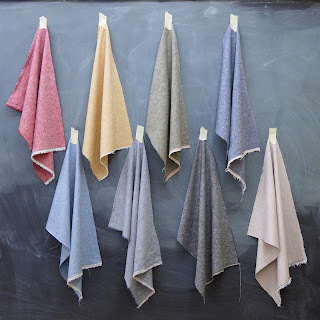 Beautiful, drapey, flowy Brussels Washer Yarn Dyed fabrics from Robert Kaufman are here. These fabrics are a 55% Linen, 45% Rayon blend which makes for extra dreamy summery goodness. 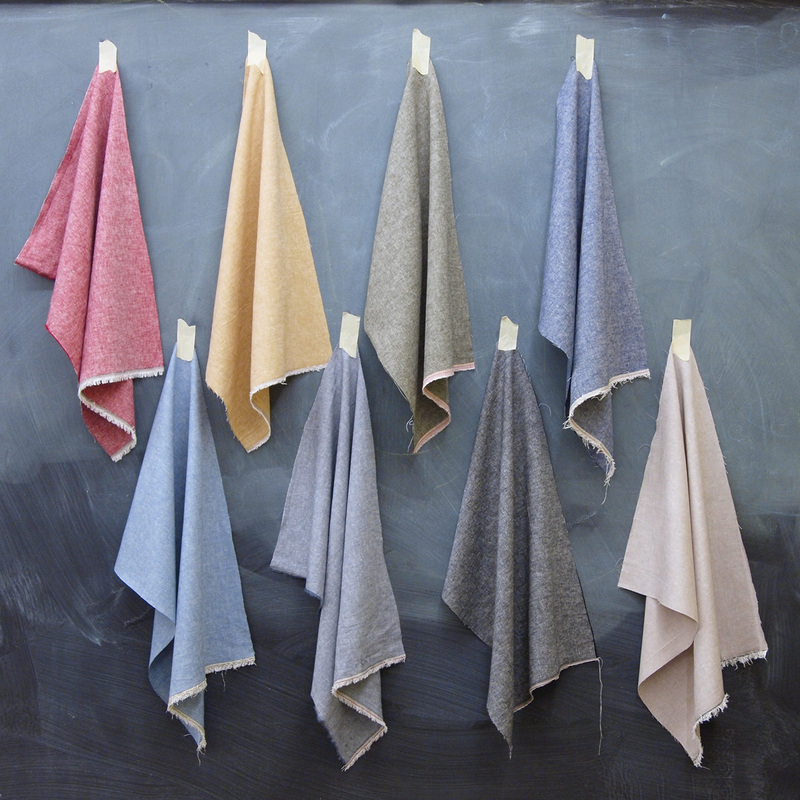 The muted colors are made from using an un-dyed yarn for the weft and a dyed yarn for the warp. 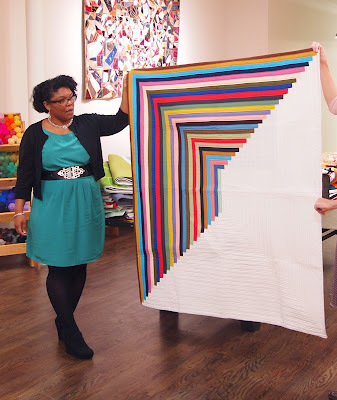 We stock all 8 colors of this 52" wide lusciousness for your sewing pleasure. The best part of this fabric? It is so affordable at only $10 a yard! These fabrics would be great for dresses, skirts, napkins, or pillows. I am excited to make a Staple Dress out of this fabric in the olive-y green color. We couldn't resist making up some fat quarter bundles so don't be shy about incorporating these beauties into your quilt projects or use it as a ready-to-go napkin set! 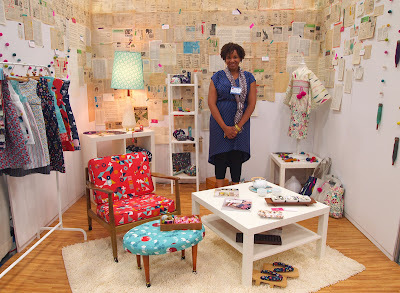 Athena is one of those customers who is always inspiring us with her projects. She picks out amazing patterns and then comes in a few weeks later to show us her new sweater, shawl or leggings that she just finished. When she picked out some Breeze yarn in Butter I immediately asked her what she was going to knit with it. As soon as she showed me the pattern Xia by Kessa Tay Anlin, I knew I had to make one too. 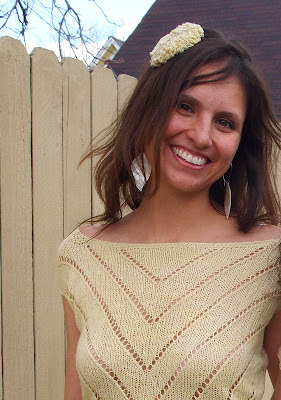 I am really into our summery yarns and I love knitting sweaters so much, there is no reason I can't knit and wear sweaters all summer long. Xia is Chinese for "summer" so it really is the perfect summer top. 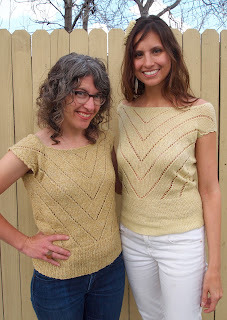 The simple lace pattern creates a chevron pattern down the middle of the sweater on the front and back. The neck and arms are finished with a simple crocheted border - the scallops on the arms make for a feminine touch. This sweater knit up quick. Athena whipped this out in just a couple of weeks, but mine took a bit longer at a month. I am super happy with the fit and look of this sweater and am excited to wear it all summer long! 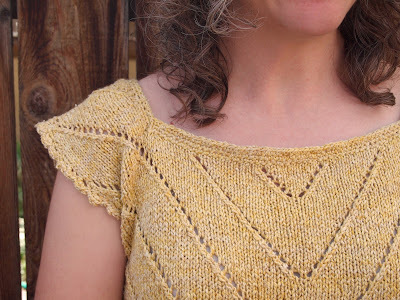 Athena's Xia is knit with one skein of Anzula Breeze. Breeze is a 65% Linen, 35% Silk lace weight yarn. 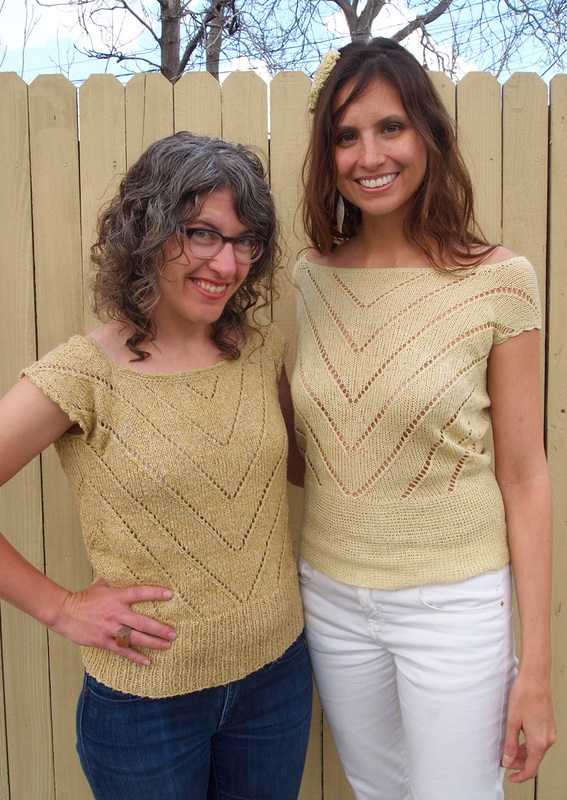 Because of the fine weight of the yarn, Athena's sweater is a lighter, lacier weight fabric than mine. It is beautiful! She also made the crochet flower accessory--an optional part of the Xia sweater pattern--to wear in her hair. 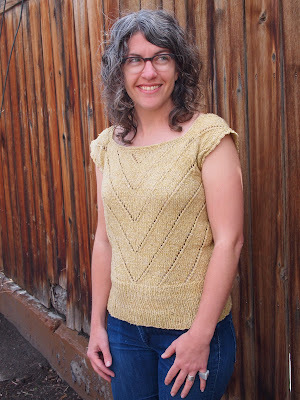 I choose to knit my Xia in the Anzula Oasis - a dk weight yarn that is 70% silk and 30% camel. I used two skeins in Canary. The camel adds a little more memory and depth to the silk. I changed up the pattern a bit and chose to knit the bottom in 1x1 ribbing instead of garter stitch. I wanted a stretchier bottom band and this was a simple alteration to make to the pattern. 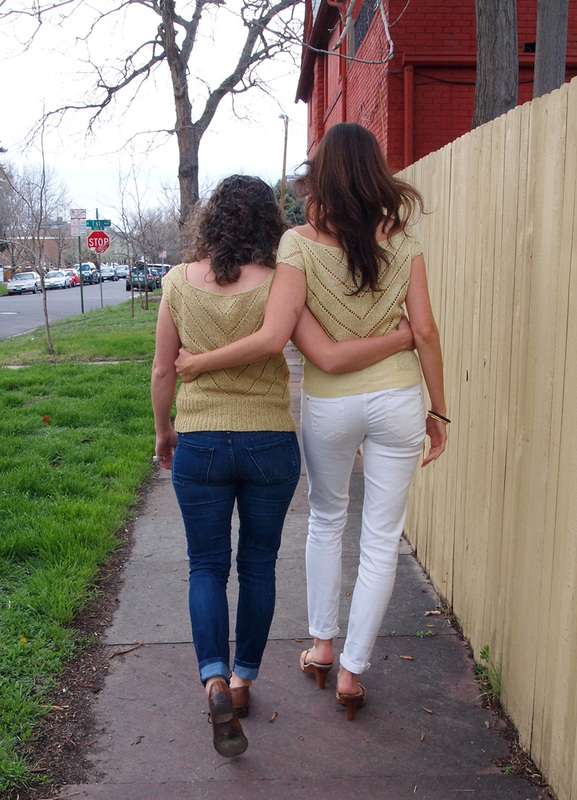 Now Athena and I have gorgeous matching summery buttery yellow sweaters to wear!